Folk Alliance International is pleased to announce Harry Belafonte, Robert Johnson, and The Highlander Center as Lifetime Achievement Awards Recipients. The awards ceremony will take place during the Folk Alliance International Conference in Memphis, TN February 22-26, 2012. The art of discovery is alive and well at the 24th Annual International Folk Alliance Conference, February 22-26, 2012 in Memphis. See you there! Folk Alliance International is pleased to announce the recipients of the 2012 Folk Alliance Elaine Weissman Lifetime Achievement Awards are Harry Belafonte, Robert Johnson, and The Highlander Center. The awards presentation will take place on the opening evening of the 24th Annual International Folk Alliance Conference on Wednesday, February 22, 2012 in Memphis, Tennessee. Named after one of the founders of the Folk Alliance organization, these awards signify both achievement and contributions to the Folk community. Visit http://www.youtube.com/folkalliance for many of our great Lifetime Achievement Award videos including The Carter Family, Utah Phillips, Jean Richie, Stan Rogers, Odetta, Les Blank, Joan Baez, Jimmie Rodgers, Rounder Records, Tommy Jarrell, Mavis Staples, Elizabeth Cotten, Bob Dylan, Phil Ochs, Guy and Candie Carawan, The Old Town School of Folk Music, and many more great FAI vidoes. Singer, actor, student of folk music, Harry Belafonte has been responsible for much more than recording so-called "novelty" hits like "Matilda". Taking after his mentor Paul Robeson, he parlayed fame and fortune into worldwide, world-changing social activism. Harlem-born, son of a chef and a domestic worker, he sang in clubs to pay for acting classes after serving in the Navy during World War II. His meteoric rise, based on several million-selling hits and a brace of movies, allowed him the freedom to support civil rights and human rights organizations in North America and beyond. He introduced many new performers to American audiences, including Miriam Makeba, Nana Mouskouri, and Bob Dylan, whose first recording was a harmonica track on his Midnight Special LP. He continues to be outspoken and supportive of positive social change. Between 1961 and 1971 he produced a massive eight-LP, 100 page booklet anthology of 80 songs, including African roots, spirituals, work songs, ballads, and blues. By then, however, his stature as a hit maker had declined, and RCA dropped the set. BMG finally brought out The Long Road to Freedom as a boxed set on September 11, 2001. This mysterious man who died at twenty seven, has three separate grave sites, and languished in obscurity for a generation, may be the most influential nonentity in history. His hottest record, Terraplane Blues, sold five thousand copies when issued in 1936. Compared to the millions of copies his records sold from 1961 onward, the legends built up about him by publicists, rock stars, and writers like Griel Marcus and Robert Palmer, the brilliance of his syncretic approach to the music of his day and his unequivocally masterful guitar and vocal technique tends, to put it charitably, be obscured. Among other things, he adapted his songs and their settings to the commercial three minute standard, routinized the main 'Drew' style of Delta playing such that it became amenable for performance outside of dance contexts, and wrote truly original, intelligent blues numbers without relying on floating verses. 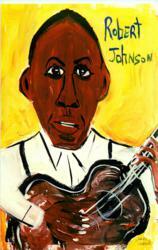 Johnson was flexible enough in his playing to handle the rawest country blues alongside Jazz, Country, and pop standards, and introduced the 12/8 boogie piano shuffle into blues guitar playing, all in about a six year itinerant span supported mainly by tips from strangers. Myles Horton and Don West founded the Highlander Folk School (now Highlander Research and Education Center) in 1932 in Grundy County, Tennessee. Modeled on Danish "Folk Schools", Highlander provides leadership education for social movements in the south. From the outset, Highlander integrated cultural work into all its programs, helping spread songs like "We Shall Overcome" from striking tobacco workers in the 1940s to civil rights leaders in Nashville in 1960, after which it spread across the globe. Over the years, Highlander's work has been central to the union movement, the civil rights movement, the struggle for economic justice in Appalachia, the environmental movement, and international struggles against globalization. And through it all, figures like Zilphia Horton, Guy and Candie Carawan, and Jane Sapp have used music, drama, dance, and stories to help empower ordinary people in their work for social justice. The school was shut down by the state of Tennessee in 1961 due to its policy of integrated workshops, but quickly rose again in its current location in New Market, Tennessee. It continues to provide education and resources for activists across the south and around the world. Since 1989, Folk Alliance® has served as the headquarters for Folk Music and Dance. With over 2800 members worldwide and an annual conference that is one of the five largest music conferences in North America, Folk Alliance continues to grow and mature while providing a unique range of member services to our community. Over the years, our community has grown to include record companies, publishers, presenters, agents, managers, music support services, manufacturers, and artists that work in the folk world. Folk Alliance has six regional affiliates that provide the grass roots efforts in their respective markets. Folk Alliance International exists to foster and promote traditional, contemporary, and multicultural folk music, dance, and related performing arts. The Folk Alliance seeks to strengthen and advance organizational and individual initiatives in folk music and dance through education, networking, advocacy, and professional and field development. The art of discovery is alive and well at the 24th Annual International Folk Alliance Conference, February 22-26, 2012 in Memphis. See you there. 2012 Conference Registration formSend in this form to get registered for the 2012 conference! Membership FormJoin the Folk Alliance!